An independent, family-run brewery for over 100 years. True Belgian craftsmanship. That's Haacht Brewery. Immerse yourself in their past and discover how they are looking towards the future - determined to keep their own special character that they are so proud of. There used to be a dairy farm "Melkerij van Haecht" on the current site, long before Haacht Brewery existed. At the helm of this dairy was Eugène De Ro who was a fermentation engineer. In 1898, Eugène De Ro brewed his first top-fermented beer. Four years later he also ventured into brewing bottom-fermented beer. This type of beer was so successful that the "Brouwerij en Melkerij van Haecht" was at the top of the Belgian brewing world in 1913. During the 1920s, they still transported their beer kegs by rail. The ‘beer tram’ literally passed through the grounds of the brewery and transported the kegs to Schaarbeek. These were then loaded onto carts and delivered to beer merchants and cafes across Brussels. In 1929 the dairy closed. This allowed the brewery to expand production into other types of beer: Bock, Export, Pilsner and Stout Ale. 1937 was a record year for the brewery - it sold over 50 million litres of beer! The first bottling plant dates back to 1950, another idea by Eugène De Ro. A year later his son-in-law Alfred van der Kelen took over management of the brewery. 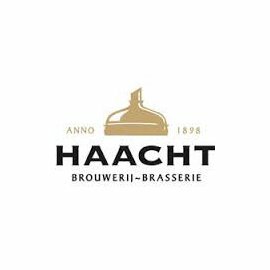 Haacht Brewery bought out a number of smaller breweries to allow them to distribute beer across the whole of Belgium. Alfred van der Kelen died unexpectedly in 1968 and was followed by his son Frédéric. Between the 1970s and the 1990s he dramatically expanded the company's property portfolio. By taking over breweries in the South of the Netherlands and Northern France, they were also able to get a foothold in their neighbouring countries. They started updating all of their production equipment in 1990. Completed in 2010 with the introduction of a new kegging hall. Today Haacht Brewery is an extremely modern company that is ready for the future. Frédéric van der Kelen is still at the helm. Around 40 years of dedication has made Haacht Brewery into the third largest pilsner brewer on the Belgian market. The fourth generation is ready to face the new challenges of the future with the same passion and dedication.